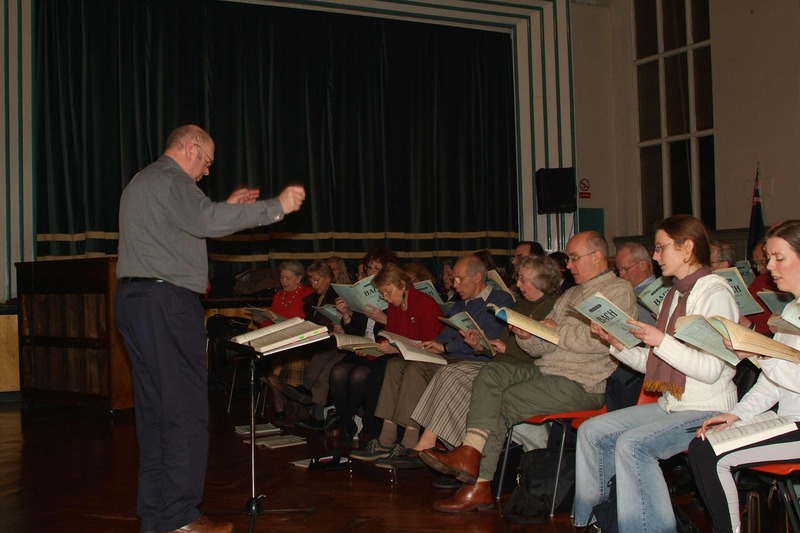 The choir’s origins date back to the time in early 1950 when a series of lectures was given by members of staff of the University of Sheffield’s Department of Music. Those staff members included Professor Stewart Deas, Emeritus Professor F H Shera and a lecturer, Roger F T Bullivant, together with invited speakers of note from outside the University. The lectures were a great success and the Sheffield Bach Society was subsequently founded at a meeting called on 1 May 1950 by Professor Deas. The founding officers were the Bishop of Sheffield (Chairman), Professor Deas (Hon. Director) and Mrs Eileen M Denman, a member of the University Registrar’s staff (Hon Secretary and Treasurer). Mr Norman J Barnes MA, BMus (Oxon), FRCO, music master at King Edward VII School in Sheffield was tasked with forming and conducting a choir. Roger Bullivant was appointed as the Choir’s first rehearsal accompanist, and served in that capacity until becoming Conductor of the Choir in 1962, a post held by him with much distinction until 2000. Mrs Denman acted as Chairman from 1979 until 1988, then as Choir Secretary and finally Archivist until retiring in 1999. Both Roger Bullivant and Eileen Denman were awarded MBEs in recognition of their services to music, the former in 1984 and the latter in 1999. Following the death of Eileen Denman in December 2001 a Service of Thanksgiving for her life was held in February of the following year at Sheffield Cathedral. A similar service was held in February 2005 for Dr Bullivant, who died in November 2004. Addresses at this service were given by the University of Sheffield’s Peter Hill and by Dr Simon Lindley who was to become the Choir’s conductor in 2009. The Sheffield Bach Society organised their first public programme in the Victoria Hall, Sheffield on 28 November, 1950, with a concert by the Stuttgart Chamber Orchestra. The choir has performed a great number of works through the years, the first programme being in February 1951. Concerts by invited orchestras have also taken place, such as the performance by the London Harpsichord Ensemble in October 1954. In 1964 Dr Bullivant formed the Society’s own orchestra of professional musicians, the Sheffield Bach Players. More recently, Bach Choir concerts have been presented with the South Yorkshire Symphony Orchestra and, currently, with the National Festival Orchestra. occasion was Dr Simon Lindley. Peter Collis was appointed conductor on Dr Bullivant’s retirement in 2000 and served until 2008. Peter’s involvement with music began when he was a Cathedral Chorister, followed by four years at Bretton Hall, conducting studies in France, time as a music teacher in Manchester, moving on to London to work on ground breaking music education projects in choral music, where he pioneered links between professional musicians and schools. Peter joined the choir following seven years with the Derwent Singers in Derby and ten years previously with the Lea Singers in Harpenden. He retired from the Bach Choir in 2008 and has sadly since passed away. The Sheffield Bach Choir has performed at venues such as Sheffield Cathedral, Sheffield City Hall, the Victoria Hall, the University’s Mappin Hall and Firth Hall, St John’s Church, Ranmoor, Ecclesall Parish Church and St Mark’s Church, Broomhill. Works by a large number of other composers have also been performed, by composers such as Bernstein, Brahms, Dyson, Mozart, Dvorak, Schubert, Monteverdi, Orff, Stravinsky, Bruckner, Vivaldi, Elgar, Britten, Vaughan Williams and Tippett. A particular feature of the Society’s work has been the performance of less familiar contemporary works, early examples being John Joubert’s The Martyrdom of St Alban and Anthony Hedges’ Epithalamion. In addition to the concert programme there have been private events such as members´ meetings, receptions, talks, visits to musical events elsewhere and Society dinners. Friends and patrons are invited to the choir’s social events, including an annual Garden Party, and social dinner. The choir continues to perform a full programme of concerts and to recruit new singers in all voices.